I was coming to shore after a duck hunt when a cormorant came flying over. 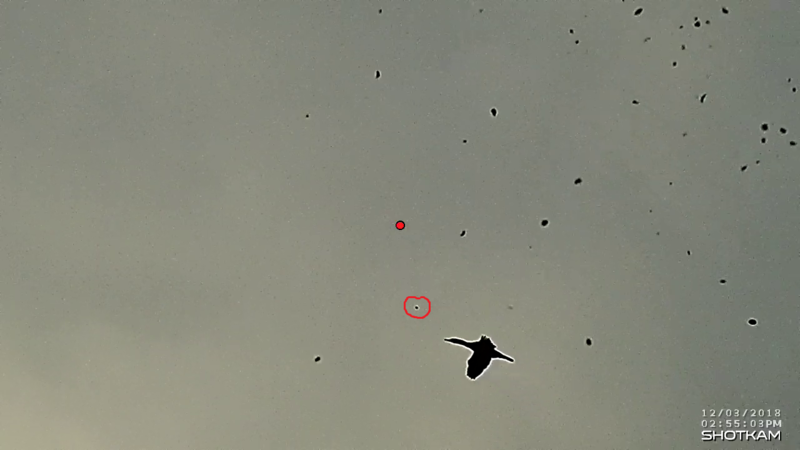 I had a couple of slugs in my pocket and decided to give it a try (cormorants can be hunted in Denmark if you have a special permission) The range was about 50-60 meters and my Shotkam captured the incident. In the slow-mo you can see the slug passing close to the bird. The "confetti" in the picture are unburned Unique powder - no wonder the barrel always look dirty after shooting this powder. The mentally shaken bird did an Immelman turn and took of in the same direction it came..
Last edited by Cap'n Morgan; 12-04-2018 at 01:55 PM. You would be a fun guy to hunt with Cap'n! You know you've probably cost several of us a bunch of money to get that new "toy"
OH yeah: I can see one of those in Randy's future. I like the small one that attaches to a pic rail. All my guns have pic rails. I'm guessing it is a Danish thing to take slugs duck hunting!?! Your ducks are that big? Now if you had one 'o them bright powder coated slugs as suggested in another thread you might not have needed a Shotkam to see the slug! Just a little less lead and you'd have got him. "Close but no cigar!" If you ever visit Ohio head north to Lake Erie. Cormorants, thanks to a hurricane +30 years age, migranted from coastal regions to the Great Lakes. Not sure if it would be legal but i can arrange a 30' boat if you want to bag a couple. We get a lot of cormorant here. Not as many this year for some reason, but some years they seem as numerous as geese. We are not allowed a hunting season for them in Minnesota, but I think the southern US does have some hunting of them. I'd rather see a season on swans first. We have them all over the place down here. On Hwy 101 south of Santa Barbara and right before Summerland there is a big tree right next to the freeway which I call the Cormorant Tree. The tree is dead and there is always a hundred or so roosting in it. The ocean is right on the other side of the tree. I have lived in NW Ohio my whole life and have been fishing western Lake Erie since I was 9 or 10 and a few years later started hunting ducks and geese there. I never seen a Cormorant until about 1980 and within a few years we had them by the thousands. There is a small island about 10 miles offshore that used to have plenty of live trees and green vegetation in the summer when we would fish in that area. For many years now everything is dead on that island, the Cormorants use it as a roost and their droppings have killed everything that once lived there. As far as I know they are still protected here but if they did make it legal I am sure it would be well received by hunters / shooters and they would quickly share the same fate as the buffalo. The Cormorants are thriving over here. At one time it was hunted to extinction, but now we have about 30.000 breeding pairs. Although Denmark is a small country, we have 4500 miles of coastline for the Cormorant to prowl for fish. The fishermen are not too happy with the bird.. Here's a few more pics of the near-miss. I'm not sure if the slug passes in front or behind the bird.